$6 (plus museum admission). Salem residents, museum members, and youth 16 and under FREE. Same-day timed tickets to Yin Yu Tang may be purchased at the admissions desk. During the Qing Dynasty (1644-1911), a prosperous merchant surnamed Huang built a stately sixteen-bedroom house in China’s southeastern Huizhou region, calling his home Yin Yu Tang. Among the many literary interpretations of this name is the desire for the home to shelter generations of descendants. Yin Yu Tang was home to the Huang family for more than two hundred years until 1982 when the last descendants moved from the village. The home was oriented in the village according to principles of feng shui to ensure a harmonious relationship with the landscape and was constructed according to local building traditions and customs. Coins were placed under structural columns to bring prosperity to the home’s inhabitants. The first floor bedrooms have intricately carved lattice windows that look out onto two fish pools in the central courtyard. 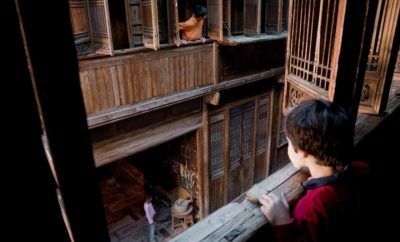 These details tell as much about the aspirations, identity, and creative expression of the Huang family as they do about the architectural heritage of the region. The family’s well-documented genealogy and the accumulation of furnishings passed down through eight generations offer the opportunity to understand historical changes in China as they affect individuals in their daily lives and cultures on a global scale. With the museum’s already extensive collections of Asian art and period architecture, the acquisition of Yin Yu Tang provides unrivaled opportunities to explore the artistic and cultural heritage of rural China and the multi-faceted, often surprising, connections between Asia and America. Yin Yu Tang is available for scheduled self-guided, audio, and docent-led tours. Ask admissions staff for times and availability. The frequency and size of tours are limited to optimize visitor experience and protect the historic structure. Tour Yin Yu Tang online. The Website winner of interactive design, online exhibition, and education awards uniquely illustrates the richness of the region’s artistic and cultural heritage and the story of the Huang family through original audio and video clips, photographs, and text. Furniture, furnishings and films about Yin Yu Tang are now on view in the Ground Level Chinese art gallery, adjacent to the Double Happiness exhibition. Also, please enjoy interpretive materials, objects and a video about Yin Yu Tang on the Ground Level outside Morse Auditorium and on the Level 2 landing. Yin Yu Tang, a 200-year-old Chinese house, was brought to America and re-erected at the Peabody Essex Museum. Please watch your step, and help us preserve the house and its contents by not touching. Still non-flash photography for personal use is permitted but videography is not. The house offers limited wheelchair accessibility. Please contact our Guest Services Department for additional information at 978-542-1644. Yin Yu Tang is outdoors and is cool in fall and winter. Backpacks and umbrellas are not permitted in the museum or in the house. Please check these belongings in the coat room. Strollers are not permitted in Yin Yu Tang; you may leave them with our staff at the entrance to the house. For wheelchair accessibility, please speak with a Guest Services representative. Free audioguides are available at the information desk and should be obtained prior to your ticket time. Before your visit, listen to No. 50 for an introduction to Yin Yu Tang. Once inside, look for bricks with engraved numbers. Press the number plus the green Play button to hear the audio. Please be at the doors to Yin Yu Tang five minutes before your scheduled visit. Because we must limit the number of guests in the house at a given time, a staff member will alert you shortly before the end of your time slot. If you arrive late, your visit to Yin Yu Tang will be shortened and is not guaranteed. Thank you! Please enjoy your visit! From 10 to 11:15 am and 1:15 to 2:15 pm Tuesday through Friday, Yin Yu Tang is unavailable to our general audience due to scheduled school group and adult group visits. All times are subject to change without notice. Certain restrictions may apply.